Part Used & Method for Pharmaceutical Preparations: The mineral is ground into powder. 1. Excessive heat at the qi level due to invasion by exogenous pathogenic heat manifested as high fever, irritability, thirst, profuse sweating and surging, rapid and forceful pulse. Gypsum (Shigao) is used with Anemarrhena rhizome (Zhimu) in the formula Baihu Tang. 2. Excessive heat at both qi and blood levels due to invasion by exogenous pathogenic heat manifested as continual high fever and maculopapule. 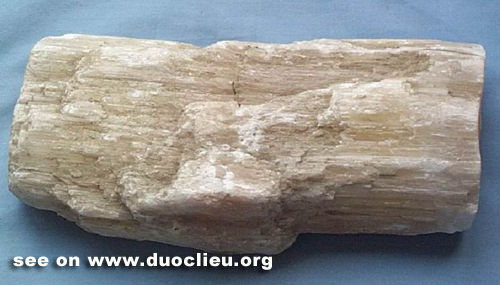 Gypsum (Shigao) is used with Scrophularia (Xuanshen) and Rhinoceros horn (Xijiao). 3. Cough and asthma caused by heat in the lungs manifested as cough and asthma accompanied by fever, thirst and desire to drink. Gypsum (Shigao) is used with Ephedra (Mahuang) and Apricot seed (Xingren) in the formula Ma Xing Shi Gan Tang. 4. Flaring up of stomach fire manifested as toothache, swollen and painful gums and headache. Gypsum (Shigao) is used with Fresh rehmannia root (Shengdihuang) and Anemarrhena rhizome (Zhimu) in the formula Yunü Jian. 5. Eczema, burns and abscess. Gypsum (Shigao) is used with Natural indigo (Qingdai) and Phellodendron bark (Huangbai). Cautions & Contraindications: This herb is contraindicated in cases with a weak stomach.